"How bored are you right now? How bored will your readers be?" Bradford Cox can talk for hours about many topics. Twice in the span of 90 minutes, he stops himself to check if he's rambling, but he's rarely ever boring. Whether it's discussing his appreciation for typewriter art, why using a pianette with a wah pedal is better than a digital synthesizer, or his dog Faulkner's disdain for an old vintage pillow ("He finds it vulgar"), Cox knows how to keep a conversation lively. 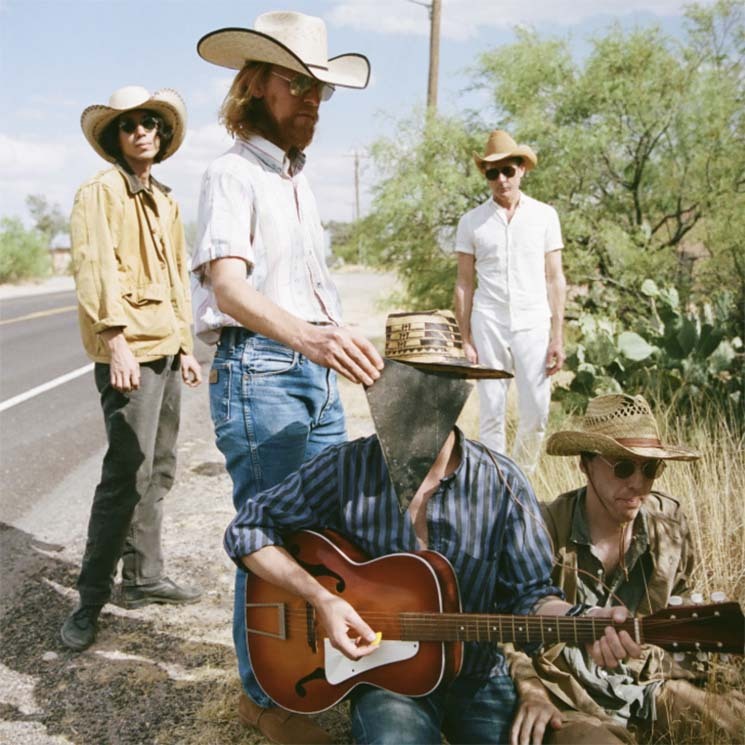 His band Deerhunter are set to release their eighth full-length, Why Hasn't Everything Already Disappeared?, yet another intriguing entry into a catalogue that is largely unparalleled amongst their peers. Once again co-produced by Ben Allen, who worked on their previous albums, 2010's Halcyon Digest and 2015's Fading Frontier, recording initially began while Cox was busy collaborating with Welsh avant-pop musician Cate Le Bon during a residency in Marfa, Texas. Originally the plan was for the two of them to work on an EP of improvised music together, but Cox quickly realized Le Bon was the right person to help Deerhunter work on their album. "I had written this record and then decided to work with Cate, but then we just planned to stick around in Texas and keep working with Cate," Cox says. "I love being around Cate and Tim Presley [aka White Fence, who played on the record]. They're wonderful, inspiring people. It was really just lots of interesting people hanging out together and enjoying each other's company." The EP with Le Bon will still see a release at some point, Cox adds. "It's all recorded. It's just a matter of sifting through it, because it's all rather avant-garde — and I say that not in a pretentious way. There was nothing pre-written. It was literally messing with an altered piano and limited access to stuff. We were in this studio in Marfa, Texas working with this guy's personal stuff. We didn't have all of our gear until Deerhunter came and brought it." The way Cox describes the making of Why Hasn't Everything Already Disappeared? is as a mass collaboration, and the first album to include latest member Javier Morales. The addition of Le Bon was an important one, especially for a room full of men. "I wanted a strong female presence, you know, to block any displays of testosterone," Cox says. "I'm just kidding — there isn't any testosterone in Deerhunter. None, never. I have no problem saying that I feel there's a great under-appreciation of female technical minds though. I'm tired of a certain kind of male-dominated sound." While it's easy to think that Le Bon simply oversaw the recordings in Texas, and Allen at his Maze studio in Atlanta, Cox says it was a team effort with each producer playing different roles. "Cate and I are coming at it more like free art approach," he explains. "It's improvisational and avant-garde, where we're coming at it without a preconceived logic, whereas Ben is very organized. A lot of that times we need that organization, that conservative element. I think we need both. I'm a centrist. I believe in moderation. I don't think anything's as good if it's limited to one perspective. "The record is a canvas. Sometimes Cate and I would get the canvas looking like one thing, and then Ben would come in and say, 'This is great. How about we display it this way in the gallery so it has some context?' Cate was an inspirational guide, and Ben was more of a logical guide." Another guide for Cox, in particular, was his daily visit to Goodwill, the second hand non-profit that has become his second home. "I go to about five Goodwills a day," Cox admits. "It's sort of my own version of transcendental meditation. When I go into a Goodwill, or a library or a record store, I feel that I'm in a sacred place of discarded culture that still has a life in it. It's the feeling some people might have going to church. I feel imbued with the spirit of these artefacts, things that a lot of people call junk." Certain pieces of equipment Cox found were used on the record, including a reel-to-reel tape recorder and an autoharp. But Goodwill's greatest contribution to Why Hasn't Everything Already Disappeared? was arguably its choice of in-store music. "One random day I was in Goodwill during the recording process and over the loud speaker they piped in 'How Will I Know' from Whitney Houston's first album," Cox says. "I was just stunned by it. I went into a trance. Obviously the ultimate beauty was the natural power of her voice, but I found that the entire song was impregnated by a sense of longing, melancholy, but also this universal feeling that we can all tap into." This epiphany brought on a radical change in direction for one of the album's standout songs, "Plains." While the song and rest of the album were already submitted for mastering, hearing Whitney at this place and time forced the band to go in and rework the song. "The entire album was finished and turned in, and 'Plains' almost sounded like something off Pink Flag-era Wire or something," he explains. "But I thought that we could do better and then I started listening to a lot of Whitney Houston. I just wondered why we couldn't use that kind of energy now and make it new, you know? I played an ancient white noise drum machine called a Syncussion made by Pearl. I just decided that I wanted to spend a little more time on that one. I wanted a different arrangement, a different feeling." Despite the decision to alter "Plains" at the 11th hour, Cox insists that he and his bandmates are not concerned with achieving perfection. "I don't consider myself to be a perfectionist, but I am sort of obsessive-compulsive," he says. "I want to experiment within boundaries. I'll spend a day to get a computer to sound like a harpsichord or vice versa. It's pretty relaxed though. Each component of the song is more anonymous. We have to argue to remember who played the harpsichord on what song. You always think you'll know. Like, 'Why would I not remember that?' But when it comes time to writing it all down for the artwork we forget. Like Lockett [Pundt] has re-recorded parts I played without me knowing, but I kind of like that. It's very egoless, like whatever's best for the song." Why Hasn't Everything Already Disappeared? comes out January 18 on 4AD.